Hatters boss Nathan Jones has urged his side to remain in pole position going into the play-offs this season. Town host Notts County at Kenilworth Road this afternoon, as they sit in fourth place, with just three games to go. There’s still another three games to make sure we can achieve what we want to achieve. 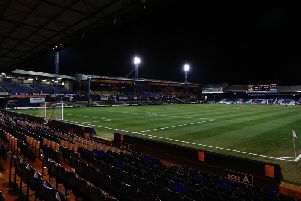 That would guarantee them home advantage for the second leg of the play-offs, and it’s a fact not lost on the Luton chief, who said: “We’re in pole position at the minute as we’re in fourth. “We want to stay there, because one if you finish in fourth you qualify for the play-offs, you also in theory get the weakest team, although it’s never that way though and you’re home in the second leg. “But what we want to do is finish as high as we can with as many points as we can. “We want to improve on last year, as we’ve shown we’re far different from last year. “Our sole goal was to get promoted automatically. Now we’ve fallen a little bit short of that, but if we fall just short of that we’ll get promoted. “There’s still another three games to make sure we can achieve what we want to achieve. It’s a great way to get promoted. We would have preferred to already be up so that we can plan for next season, but we’re still in a great position. The Magpies have been on fine run recently, as they moved clear of the relegation zone, winning seven out of 12 matches, including triumphing at both Plymouth and Carlisle. Jones wasn’t surprised by such an upturn in form, saying: “It’s that type league, the inconsistencies in the league, that’s what the league is. “There’s some good teams and some good players, but anyone can beat anyone and if you put a little run together then you tend to do things well. “What we’ve done, is we haven’t gone on a run winning games but we just don’t lose many games and I think we have a good structure, have a good way about us, how we play. “We try to win every game. At times we come up short, but it’s not for the want of trying, and we’re not a lucky team in any way where we nick results. The Magpies have improved dramatically under the stewardship of former West Ham and Newcastle midfielder Kevin Nolan, who was appointed in January too, ensuring their safety in the division is already secured. Jones said: “They will be a difficult side, he’s done a great job there Kev, to be fair, they’ve got good players, they’re a dangerous side. “It’s going to be a difficult game, it’s no foregone conclusion, but if I’m honest, I prefer the difficult games. Town could also find themselves coming up against a strikeforce consisting of former Premier League forwards in Jon Stead and Shola Ameobi this afternoon. Jones would prefer that too, adding: “There’s two good names for you there, so we’ll have to be right at it. “But that tends to motivate us a little bit more than coming up against a couple of unknown that basically want to make a name for themselves.